A Story for All Ages – Diana Thung’s August Moon – LILY & GENEROSO 4EVER! While I spend most of my media consumption focused on adult-oriented works, I always savor a breath of fresh, more optimistic air when I get the opportunity to enjoy a work made for both children and adults. Let me reassure you, I’m not one of those Disney Princess loving gals that lives with a constant childish naivete; however, I must admit that sometimes, when I’m feeling somber about being an adult, I enjoy reading a book or seeing a television show made for kids, since the best children’s content can approach serious topics with whimsy and spirit, which is sobering for an adult jaded by reality. Refreshingly, such an awakening occurred for me with Diana Thung’s August Moon. Filled with bright imagination, August Moon most resembles the Japanese folk tales I recall reading as a child. I have fond memories of tip-toeing out of my room to a wire shelving cart in the living room on quiet Saturday mornings when no one was awake to read stories filled with mysterious visitors, giant peaches, altering gusts of wind, and magical fish. Around the age of 7, I was introduced to the world of second hand books, and on one of my visits to what felt like an enormous warehouse (which in retrospect was just a two story bookstore), I found a hardback collection of Japanese folktales for a few dollars and asked to take it home. That collection remained on the wire shelving for years, and on Saturday mornings or lazy afternoons, I opened it up to read a new story or to re-read one I wanted to recall. These Japanese folk tales could have elaborate mythologies, but those fictional components remained distinctively grounded in reality, making the tales more relatable as they taught valuable lessons in honor and kindness. Like these Japanese tales of my quiet Saturdays, August Moon has an intricate and playful mythology of fictional creatures, but these creations of pure imagination exist in a reality not too far from our own, allowing the book to convey its core teaching without ever getting dogmatic or severe. 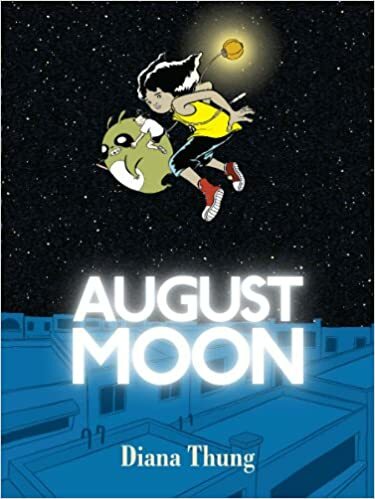 In August Moon, Fi Gan returns to Chino, her mother’s home city, one that time has somewhat forgotten, when her scientist father receives reports of the discovery of a potentially undiscovered species. As the daughter of a pragmatic scientist, Fi hardly believes in anything beyond what her own eyes can see and remains distant, passive, and overall, stoic. Fi takes pictures to document her experiences, but she hardly seems to experience anything at all, including feelings of grief for her mother’s recent passing. But, Fi’s indifference cannot remain in a city like Chino, where belief in the unknown still exists and most likely for a reason. Chino has no factories; its economy runs on the shops and the food carts that provide to the community. Beyond its own efforts to sustain its own people, the community of Chino also takes great pride in the nearby forest and spends much time and care preserving it and allowing it to remain as untouched as possible. Consequently, much of the forest remains undiscovered, leaving much to the imagination of Chino’s citizens. Of the stories of creatures seen in the forest and around Chino, the tales of Soul Fires, creatures who carry the spirit of past ancestors who light up the sky, dominate the myths of Chino. Children report on seeing them as large rabbit/hamster/bear-like creatures, and many adults recall seeing them too, so Soul Fires have been woven into the culture of the city. In fact, the Soul Fires play such a large part of the Chino’s heritage that a yearly festival exists to celebrate them. Fi and her father arrive to Chino in the days before the festival, led by Fi’s uncle, Simon Bo. The Bos, Fi’s mother’s family, have long resided in Chino, and as a result, they have more imagination, faith in the unknown, spirituality, and a love for the phenomenons of nature. On the other hand, the Gan side of the family, has lived more in an industrialized world, so they place value on the pragmatic, especially in science. Since her mother’s passing, Fi has experienced mostly a science perspective on life, but everything changes when she meets Jaden, the leader of the children of Chino and a boy with a super-human ability to move quickly and to leap long distances. After befriending Jaden, Fi meets a Soul Fire, and quickly, her father’s rationality driven upbringing fades away. A group of industrialists known as the Monkeys have discreetly entered Chino and have plans to eliminate the Soul Fires, the forest, and the overall spirit of Chino, and in order to prevent the Monkeys from laying siege on the beloved forest and city, Jaden will need Fi’s help. However, in order to help, Fi’s demeanor must change; her disaffect and disbelief must turn into passion and care. She must begin to engage with other people, and she must begin to express a full spectrum of her emotions, since only these definitively human tools will help to give her the courage and strength to support the battle against the Monkeys. Despite the adorable visual representation of the Soul Fires, August Moon never patronizes its audience and never feels cloyingly sweet and sentimental. Over the course of Fi’s transformation and battle against the Monkeys with Jaden, Diana Thung masterfully blends moments of lightness and darkness and fantasy and reality together to create an awe-inspiring story for children and captivating plot for adults. With the Soul Fires, Jaden, and Fi, Thung creates a tale that not only entertains but also teaches people, regardless of age, to understand the destructive environmental, cultural, and societal effects of industrialization and technology. While the work of the Monkeys will surely damage the land, it will also bring with it a disregard and dismissal of forces beyond humans, and that, may be the most devastating loss of all. August Moon discusses a highly adult concept but without any air of pretension or heavy-handedness, making it highly effective, for the book can facilitate discussions across and within multiple generations. It has plenty of whimsy and action to pull in children, and it has absolute relevance to adults’ present and past. Given this balance of material for audiences of different ages and according experiences, August Moon simultaneously returned me to those Saturday mornings of my own childhood and kept me in my current reality, allowing me to enjoy it with both a childish joy and an adult perceptiveness along with my own ageless, timeless fascination for engaging storytelling. August Moon by Diana Thung is available via TopShelf Productions.